What’s the pill you are taking? I spent many years writing seven editions of A Consumers’ Dictionary of Cosmetic Ingredients and A Consumers’ Dictionary of Food Additives so that you could understand the long chemical names on the label. At the beginning, many of you didn’t know anything listed with dextrose has sugar or that sodium was the name used for salt. You are more knowledgeable. There are hundreds of ingredients that, if you don’t know what they are, you can look them up in my dictionaries. Now I discovered an even more confounding problem. The labels on medicines. In the past, when I was young are sharp-sighted and took no regular medications, I didn’t pay sufficient attention to what was written. If I did have a question, I would just grab a Physician’s Desk Reference and compare the pill to a colored picture of it and find out what it was. Now, I am older, wear glasses and can’t read the tiny print on the labels. There are millions of us past 40 years who can’t see the fine print and if we can, we may not know what it means. To make matters worse, our pharmaceutical manufacturers have moved from the United States to far off places such as India and China. 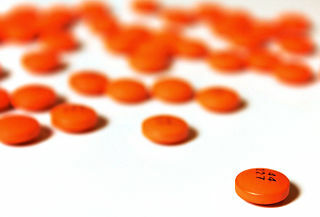 Aside from the lack of FDA supervision (that’s another story), the pills are usually orange or pink and round. You used to be able to tell that a small, white triangular pill was to Norvasc®, for example is amlodipine besylate produced by Pfizer and is a triangular white pill. Daikichi Sankoyuo produces a generic amlodipine beyslate/olmesartan medoxomil,) under the name,Azor®) .It is a round yellow pill that looks like hundreds of other generic medications. And according to druggist with whom I spoke, distributors may hand out different colored generic amlodipine beyslate from more than 50 manufacturers. The colors vary from the original Norvasc® The appearance of a brand-name drug is trademarked. Supposedly, the active ingredients should be identical. Is it? Pharmacists are required to fill your prescriptions with generics unless your physician writes you must have the name brand. The “no-name” pills may come from one company or another. One brand may have a lot of the active ingredient and the other may have almost none. I swallowed a generic medication made by a large company in India and immediately became ill. When I was switched to another generic of the same medication made by another company, I was fine. Of course, it may have just been a coincidence and it would be hard to prove the first generic was the cause of the upset unless many people who had the same reaction took the time to report it. Generics are cheaper and that is why the government and the insurance companies are insisting we take them. But how do we know where the pills were produced? Who was supervising to determine the amount of the medication and the inactive ingredient were in balance? Is anybody from the FDA inspecting the foreign sources of generics? There are reportedly three US agents assigned to Chinese pharmaceutical manufactures who now produce a large percentage of our medications. Pharmacists are required to fill your prescriptions with generics unless your physician writes you must have the name brand. The “no-name” pills may come from one company or another. One brand may have a lot of the active ingredient and the other may have almost none. I swallowed a generic medication made by a large company in India and immediately became ill.